Global inulin market is expected to witness growth due to increasing ease of incorporation of prebiotic ingredients in food & beverage industry. Inulin is increasingly used in dairy product formulations such as spoonable yogurts, cheese, and ice creams. Dairy industry growth is expected to be a key driver for inulin market over the next six years. Increasing awareness towards low calorie and sugar reduction on account of rising diabetes prevalence is expected to play a crucial role in driving inulin market growth over the forecast period. Gaining importance of nutraceuticals on account of rising health awareness is expected to fuel demand for inulin as a functional ingredient. Inulin plays an important role in enhancing the activity of selected beneficial bacteria, which inhibits the growth of certain pathogenic bacteria, resulting in better colon health. U.S. FDA has declared inulin as a recognized as a safe (GRAS) product, which paves the way for its use in pharmaceutical applications. Growth in the pharmaceutical sector is expected to have a positive impact on inulin market over the next six years. Rising demand for substitute prebiotic ingredients including MOS and GOS is expected to pose a credible threat to market growth over the forecast period. The abundance of chicory roots in Europe is expected to force manufacturers to establish their manufacturing sites in the region. However, growing chicory roots production in Hebei region of China is expected to ensure raw material availability for market players operating in the region. 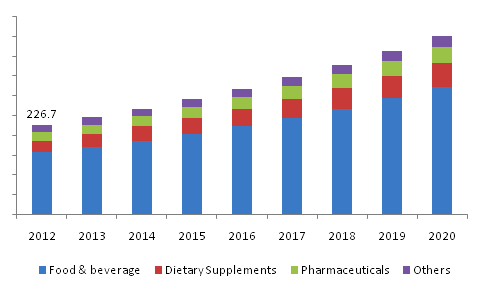 Food & beverage is expected to remain the largest application segment over the forecast period owing to gaining importance of functional ingredients for improving gut health function and reducing sugar level. Growing demand for dairy products such as cheese, yogurts and ice cream in Australasia and Middle East is expected to force manufacturers to deploy their efforts on increasing production capacity in aforementioned regions. As a result, increasing diary production in these countries is expected to fuel inulin demand over the forecast period. Inulin comprises a non-digestible fiber, which plays an important role in stimulating bacterial growth to maintain calorie level of the human body. This feature of inulin is anticipated to promote inulin market demand in the fortification of dietary supplements over the forecast period. Inulin also finds its application as natural ingredients in animal feed, construction and coating industries. Europe was the largest market, accounting for over 40% of global inulin market share in 2013 and is expected to witness growth owing to regulatory support intended for promoting the incorporation of functional ingredients in regional food & beverage industry. However, sluggish growth of food & beverage industry in Germany, Italy, and Spain coupled with European Commission’s limitation on production quota for inulin are key challenging factors for the market. Growth in dairy production and pharmaceutical industry in Mexico are anticipated to have a significant impact on inulin market. Positive dairy industry outlook in India and China owing to domestic demand growth coupled with favorable regulatory support for FDI is expected to fuel inulin market demand. Food & beverage industry growth in Saudi Arabia and Brazil is expected to play an important role in driving inulin market over the next few years. Global inulin market is highly competitive owing to the presence of a limited number of companies in the market. Key market players include Beneo-Orafti, Jarrow Formulas, Sensus, and Cosucra. Strategic partnerships with companies using the product to manufacturing inulin and product innovation are expected to remain critical success factors for the market. The government of India has announced subsidy allocation at a state level for farmers to promote chicory farming. This move is expected to increase production of chicory roots in India and ensure raw material supply for inulin production over the forecast period.